It's raining fringe theories, fake news, and pseudo-facts. These lies are getting repeated. 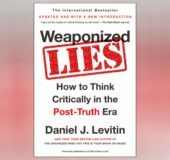 New York Times bestselling author Daniel Levitin shows how to disarm these socially devastating inventions and get the American mind back on track. Here are the fundamental lessons in critical thinking (previously published as A Field Guide to Lies) that we need to know and share now. This urgently needed book enables us to avoid the extremes of passive gullibility and cynical rejection. As Levitin attests: Truth matters. A post-truth era is an era of willful irrationality, reversing all the great advances humankind has made. Euphemisms like “fringe theories,” “extreme views,” “alt truth,” and even “fake news” can literally be dangerous. Let's call lies what they are and catch those making them in the act. Daniel J. Levitin, PhD, is a neuroscientist, cognitive psychologist, and bestselling author. He is Founding Dean of Arts & Humanities at the Minerva Schools at KGI in San Francisco, a Distinguished Faculty Fellow in the Haas School of Business at UC Berkeley, and Professor Emeritus at McGill University. He is the author of This Is Your Brain on Music, The World in Six Songs, and The Organized Mind. He divides his time between Los Angeles and the San Francisco Bay Area. The best defense against sly prevaricators, the most reliable one, is for every one of us to learn how to become critical thinkers. Critical thinking trains us to take a step back, to evaluate facts and form evidence-based conclusions.